For every driver who manages to grab a world championship, there must be several who never get a decent shot at it. Many of them could claim to be capable of the feat, if only they could get their hands on a good car. But fortune dictates that some will never have that chance and the years roll by with potential never fulfilled, once-bright hopes slowly fading and the history books reflecting only a long list of finishes and DNFs with only a handful of points per season. Giancarlo Fisichella was once as obvious a talent as is Sebastian Vettel today, a driver who made the most of his chances in his early years with uncompetitive teams. The trouble was that the years passed and he was overlooked by the top teams, his occasionally heroic performances in lesser machinery not enough to guarantee him a seat in a McLaren or Ferrari. By the time he found himself at Renault, time had moved on and now the young Fernando Alonso was to prove the master of the tired Fisi. Next year will probably be Fisichella's last in F1 as he provides the experience needed by the Force India team. There was one who burst upon the scene even more dramatically than Fisi, however. I remember well that Australian GP in 2002 when a Minardi finished in the points for the first time in ages. The driver that achieved the feat was an Australian, fittingly enough, and most of us had never heard of him: Mark Webber. The big problem with such a debut in an uncompetitive car is that it is hard to live up to the expectations it encourages and Mark's year became a familiar Minardi story of retirements and finishes just outside the points. In the years that followed he went to Jaguar and Williams at a time when both teams were on the slide. He became marked as a driver who could qualify well but whose race performances were somewhat suspect, thanks to a tendency for big name drivers to collide with him. At Red Bull Racing, Mark seems to have found his spiritual home, however, his customary good qualifying increasingly being followed by finishes in the points. 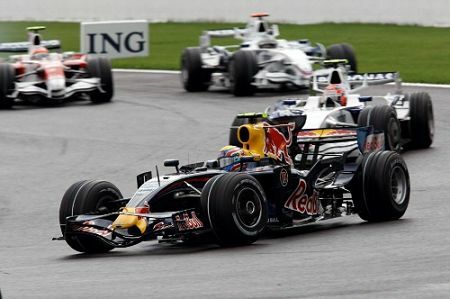 His team mate, David Coulthard, has had an awful 2008 in contrast, adding a reputation for avoidable accidents to his lackluster qualifying. It has been up to Webber to limit the team's blushes as their sister outfit, STR, have gone from strength to strength. Next season will be the first time that Mark has begun a third year with a team and his prospects ought to look bright. Designer Adrian Newey is now well into his stride at Red Bull and should produce a good car for 2009, the Renault engines seem to have taken on a new lease of life after Briatore's complaints earlier this season and Mark has fitted in well with the team. One wonders whether it is all a little late for the Australian, however. Just as Fisichella's big break was spoiled by being teamed with the rising star of the moment, so Mark's future holds the prospect of having the wonder boy, Vettel, as team mate. Is history about to repeat itself? The battle for supremacy at Red Bull will be one of the most fascinating in F1. With most of the other teams settling for their present line-up, we know what to expect - but at RBR there is a mighty contest brewing. Old guard against the new, experience against talent, the story has been repeated again and again in F1. Many are expecting that Vettel will emerge as the bright new star of the sport but this allows too little for the hardened warrior that Webber has become, I think. He remains one of the best qualifiers in the game and Vettel will struggle to beat him on that score. In the race, Mark's legendary bad luck is bound to play its part but, when given a chance, he will give the youngster a run for his money. What it means is that 2009 will be the make-or-break year for both of them. If Mark is beaten, he has little to look forward to but years of being employed for his car set up skills alone, the wise old head that keeps the team on an even keel. And I cannot see Mark adapting well to that; his pride will see him retired before that happens. If Vettel loses out in the struggle, however, he will be amazed at how fast the media lose interest. He may be the darling of the talent spotters now but, give him a season in the shadow of a known quantity like Webber, and he will fade from the fickle memory of the public. I hesitate to make any predictions of the winner in this particular battle of team mates. There are good points to make for both drivers and it might just be luck that sorts it out in the end. But, in a season that will be full of interest as we watch the effect of the new rules, Red Bull will be a show worth watching on its own. Interesting article. Funnily enough, I was pondering future MSR articles and thinking of exactly the same parallel myself - Webber and Fisi. I'm not sure it stacks up though. I don't think Fisi was ever as psychologically resilient as Webber. Someone who could get more out of a duff car than most but lacked the killer instinct to ever become a World Champion. I'm reminded of what Ron Dennis said of him about 5 years back - "If I was ever going to sign Fisi I would have done years ago." Webber's probably as fit as anyone on the grid too, so he won't suffer in comparison to his younger team mate in the way that some older drivers do. I'm still unsure about Vettel - on occasion he has looked incredible, at other times he hasn't really seemed any quicker than his team mates Liuzzi and Bourdais. If I was a betting man, I'd say he'll get a rude awakening next year alongside Webber, but he *could* prove me wrong. I think the similarity between Webber and Fisi starts with their careers following routes in which they had to make do with inferior cars and then, just as they seem to be getting a break, along comes a young hotshoe to rob them (potentially, in Webber's case). In character they are completely different - hence my belief that Webber will leave F1 if he doesn't win this particular fight, whereas Fisi has soldiered on (to what purpose, I wonder - surely he can't believe he still has it in him to be champ?). The Ron Dennis quote says it all. Like you, Patrick, I'm not certain that Vettel will turn out the quicker of the two. He does have plenty of luck, however, and that might make the difference - Webber has none. Whenever I am faced with this kind of situation I am reminded of an interview Johnny Herbert gave years ago. He was talking about how his F3000 accident had affected him and beyond the physical effects he said that the psychological effects had much more impact in his future performances. He was asked about whether he would have challenged Michael Schumacher had he not had his accident. To people who only know Johnny as the cheeky chappy of F1 it may come as a surprise that prior to his accident he was being compared to Jim Clark and he had a ferocious temper. The caravan which his family took to race meetings had a hole in one wall caused by a screwdriver that Johnny threw at his father's head during an argument. Johnny said the reason Schumacher was so successful was because he had never had a major setback in his career and therefore still felt he was indestructible. Not just physically indestructible but competitively. This was before his leg break but by that stage he had established himself as the top driver in F1. Johnny said he was indestructible before his accident but after it he could almost never get the mental feeling back again. Lewis Hamilton just now is still in the indestructible phase and despite last season so is Alonso. In his own mind he will blame his performance last season on the team and convince himself that he was victimised and blameless. The only other drivers who may have the same belief are people like Rosberg who has a team built round him and the likes of Vettel and Kubica who will be convinced that they are future champions. Kimi may me able to convince himself that this year's problems are caused by the car but being beaten by Massa must have some effect. It is probably because of this that Ferrari want him testing all winter. As well as sorting the car it stops him thinking about the situation and they can build him up mentally for the new season. There are two ways drivers lose the indestructible mindset. One is a serious accident which results in major injuries and time out of the car. The other is when their career stops moving forward. Fisichella, Webber, Button and co have been stuck at the same point in their career for several seasons. Therefore they have lost the indestructible feeling and will never be capable of being champions unless they have a bad/unlucky team mate and a significant car advantage. If Vettel can beat Webber he will maintain the mentality which will enable him to move forward. If he can't he will join the list of drivers who could have been the next big thing. I agree Clive. Next year really is going to be make or break for Webber. If it wasn't for his uncanny run of bad luck I think the situation would be very different. As it is, well, I'd *like* to see him do well but I have doubts as to whether he will (be able to). I never thought Webber was WDC material, but I have always thought he was good enough for a few wins here and there, and to be a regular face on the podium. Its sad that he is in all likelihood going to join the list of shoulda-beens. Webber has one advantage over Fisi. Even if Vettel is clearly better on races, they are likely to be much closer on qualifying which would at least make thing look better for him. Another similarity is as good as Webber might have being at Red Bull this last couple of seasons, I'm pretty sure the team expects Vettel to be their big breakout star and Webber to be the veteran in the second car. The positive thing for him as that given current expectations if Webber ends only a few points behind Vettel, things would still look good for him. I too had high hopes for both Fisi and Webber, but, I now see Webber as a 'tweener'. Somewhere in between a champion and a also ran. He certainly is never at a loss for words. If luck settles the issue then Webbers screwed. That's the trouble with racing though. In the end it all comes down to luck. Vettel is the greatest thing since sliced bread but the team mate who beat him to the Euro F3 title with equal experience and equipment has just completed his first GP2 and F1 tests. Mika Hakkinen is Schumacher's greatest rival but the his F GM-Lotus team mate who Marlboro chose in preference to Mika for F3 never started an F1 race until he was 32. Tommy Byrne the guy Senna dodged in F3 entered 5 F1 races in rotten cars. Mike Thackwell who was so highly thought of in F2 that he was paid enough to buy a plane and became the youngest driver ever to enter an F1 race barely got another look at F1. Michael Schumacher only got a break in F1 because Mercedes were prepared to write a cheque, Bertrand Gachot got thrown in jail and Willi Webber told EJ a pack of lies about his Spa experience. In reality the Spa expert that Webber told EJ about had never set eyes on the place. Luck plays a way more important part in F1 than most people will ever admit. Steven: Interesting stuff from Johnny Herbert - and probably very close to the truth. I always wanted Johnny to do better than he managed in F1 but don't think he ever got much of a chance. Filipe: Good point and I can certainly see that happening. The only trouble would be that I don't think Webber would accept being effectively the number two driver. Steven again: Yup, luck is one of those things every champion needs. It's strange how some drivers seem to have all the bad luck, while others get all the breaks.